Richard Lee, 53, has been the head of Academy of the City Charter School in Woodside since its founding in 2011. WOODSIDE — For Richard Lee, head of Academy of the City Charter School in Queens, some of the best learning comes from doing. One of the goals of the school — which serves about 400 students from kindergarten to fifth grade — is to engage children in "hands-on experiences," according to Lee, who's served as principal at Academy of the City since it first opened its doors in 2011. "Having a number of trips and experiences, having children re-create what they see on trips, what they see in books, into real life" is key to meaningful learning, the 53-year-old educator said. "We try to bring real-life examples in for children as much as possible." This could mean taking kindergarten and first-grade students on a trip to a local rooftop farm, where they learn about beehives and other agriculture before heading back to school to create their own farm communities out of building blocks. Or for fifth-graders learning how government works, it could mean a classroom visit from a local lawmaker, according to Lee. "That type of experience is, I think, very important for children, and if it's incorporated into curriculum can have a long-term impact," he said. "What you remember or what I remember of school is sometimes the trips, sometimes the experiences, more than the math problems." 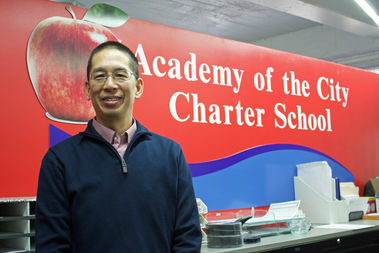 DNAinfo New York sat down with Lee to talk about his role as principal and Academy of the City Charter School's mission. What was the vision for Academy of the City when the school was founded in 2011? The founders really wanted a progressive school, and progressive school means many things to many different people. It was a hands-on, child-centered approach — certainly looking very closely at the academic work, but also at the social and emotional lives of children. What made you get involved in education and administration? The quick story is that I got into education after my first two children went to school. They seemed to really enjoy school, I also really enjoyed working with them and their friends. [I] decided to make a change of careers from the corporate world into school. So I went to Bank Street [College of Education] for my graduate degree and worked there for about six years, and also in public school, and then went back to Bank Street after teaching public school to become an administrator [there]. It seemed to me that it was the right profession — it had a lot of calling out to me, that I could make a difference in the world and affect children’s lives. What unique programs does Academy of the City offer? We do assembly every week…we have an opening song, a closing song, and children sharing. One of the pieces for us is children need to be able to present themselves publicly, orally — so not only within class, but to be able to speak in front of 150 people, or 400 people if we have a whole assembly. So our children generally are not very shy…kids here love to share. We do clubs, so children go to clubs...every week during the school day...we have clubs such as chess club and sewing club, cooking club, teen games. There's yoga club, meditation club, we've had Spanish club. Any variety of different activities that kids do. It's nice because they're intermixed with their peers…and also they’re learning skills. They’re also doing an activity that they're engaged in and they want, because they get choice of clubs…This is critically important for me. A lot of children don’t have a huge amount of choice, especially in elementary school — they go to their subjects, hopefully most children like the subjects, but they don’t really have true choice. Do you have a philosophy as an educator that guides your work? To have joyous, self-engaged learners, ones that really want to learn — that aren’t just doing reading during reading time or math during math time. And also to have a staff that is genuinely engaged with children, that are able to meet children where they are.